Washington, DC, July 6, 2018: Amul Thapar, a Cincinnati-based federal appeals court judge, has dropped off President Trump’s list of candidates for Supreme Court justice, according to National Public Radio (NPR). The three finalists are Judges Brett Kavanaugh, Amy Coney Barrett and Raymond Kethledge, according to NPR’s sources. Thapar was one of four judges interviewed for the position on the nation’s highest court by Trump on Monday, according to The Washington Post and other media outlets that quoted unnamed sources who had been briefed about the meetings. Trump’s Spokesperson Sarah Sanders had confirmed that he met for 45 minutes with four candidates, but would not identify them. Trump has said he would announce his pick next Monday. Thapar was appointed by Trump last year to the federal Sixth Circuit Appeals Court based in Cincinnati, Ohio, that covers four states including his home state of Kentucky. 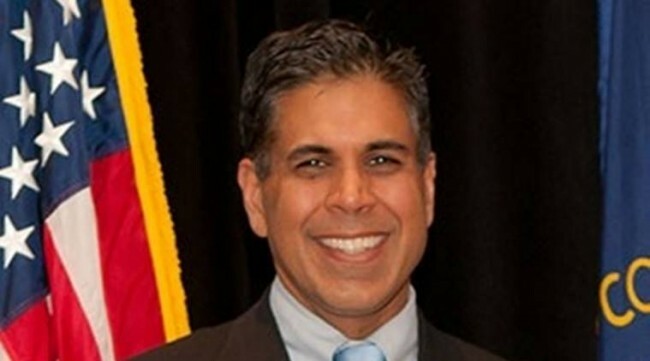 Considered a conservative, Thapar, 49, had served as a federal prosecutor before President George W. Bush appointed him a judge of the federal court for Eastern Kentucky by in 2007. Thapar had the backing of Mitch McConnell, the influential Senate Majority Leader from Kentucky, for the Supreme Court vacancy caused by the retirement of Justice Anthony Kennedy last month. “I think he’s absolutely brilliant, with the right temperament,” McConnell said on Saturday. Thapar was born in Detroit and his family wanted him to become a doctor, but he chose law instead, the newspaper said. Raj Thapar told the newspaper that his son’s only dream was to become a Supreme Court Justice. Amul’s maternal grandfather had impressed on him how Mahatma Gandhi had defeated the British using non violence, Raj Thapar told the newspaper. According his father, Amul had converted to Catholicism when he married Kim Schulte, a real estate agent, Courier Journal reported. Thapar’s mother Veena Bhalla sold a successful restaurant after 9/11 to work as a civilian clinical social worker to help soldiers returning from the battlefield, the newspaper reported quoting McConnell. According to Thapar’s bio for a convention of the National Asian Pacific American Bar Association his father had come to the US to study and after graduating went to work for Ford Motor Company. Later, he bought a share of a heating and air conditioning company.